While Amerivet Services has experienced quite a bit of growth in the last year, I’ve always wondered why it didn’t grow faster in the very beginning. The answers are showing their faces now, and I’d like to share them with you, because it’s truly a matter of opening a few minds. I think the world gets stuck thinking inside a box that doesn’t exist. This box is called a “welding shop.” It’s a cushy little place where a person can drink coffee, enjoy the warm (or cool) weather, talk on the phone, and weld a few things together. Don’t get me wrong, this box IS useful. I use mine to repair my equipment before I go meet my customers face to face, in THEIR world! The reason I finally realized the world doesn’t understand how I work comes from a phone call I received today. A guy who runs a restaurant called to tell me his steam table leaks and he can’t find anyone to fix it. He said he’s called six different welding shops, and they all told him they’ll fix it if he brings it to them. So my jaw hits the floor, because I’m thinking about the logistics of moving a big steam table out of a restaurant, loading it in a big truck, and hauling it to a welding shop, then repeating the process backwards when the repair has been made. They’ve just taken a $100 repair and made it cost $1500 and probably a trip to the emergency room (because they don’t provide mobile service, either!). Then, another conversation that Tammy had with a customer. He asked her “well, how do you know he can weld aluminum outside?” Then, “How long has he been welding?” And when she said “Most of his life” the next question was “Is he twelve?” Obviously this customer thought it was a fairy tale that aluminum welding can be done outside (and now he has seen otherwise). While the conditions have to be right, or made right, welding can happen pretty much anywhere. I’m sure astronauts have done it, and I’m sure I can do it. So along comes a guy like me, who happens to have a proven method for welding stainless steel within 200 feet of where his truck is parked, and he can park his truck almost anywhere. There are welding shops everywhere swearing up and down that this can’t be done, yet I literally repaired a steam table YESTERDAY without moving it! Can someone please tell me how to educate the public at large that it really is possible to solve their problems right where they are??? I have a guy who’s been playing phone tag with me for six months. With all the messages back and forth, he still doesn’t believe I can fix his backhoe bucket right where it is. With all the phone calls, I could’ve fixed it in 4 hours and he could’ve made maybe $200,000 with it. Yet he’s still in disbelief that it’s possible, so he hasn’t scheduled the work to be done while that backhoe wastes away in this beautiful weather. I am 48 years old. I’ve been welding continuously for 40 years. 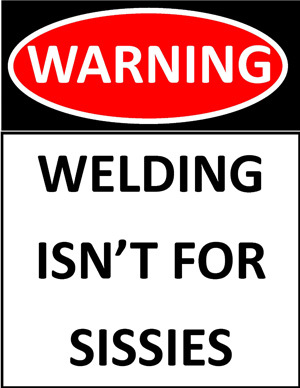 I was taught to weld so I could learn how to work for a living. I can weld almost anything up, down, and sideways. I don’t know everything about welding because it’s a huge field, but I know a whole lot about solving almost every problem, in the field, under adverse conditions, up, down, and sideways…and I learn more every day! I’ve spent 30+ years learning everything I can about electromechanical systems. Even the Air Force agrees I have a HUGE aptitude for anything mechanical, hydraulic, pneumatic, or electrical, and I’ve proven it over and over, in the field, under adverse conditions, up, down, and sideways, even in the last three days. Anything that can be done inside a shop can be done outside a shop. A shop is just four walls. I say we should knock them down and get some work done. With all this in mind, I’d like to point out that Discovery Channel has bought into my Global Education Plan (like I called them myself or something). They have a new series called “Alaskan Steel Men” that apparently is sporadic in its airing, but will show off and on through the end of the year. It centers around a marine welding company on Kodiak Island that really does go around solving everyone’s problems. THIS is what can happen when you leave that stuffy old welding shop! It’s also a whole lot about what Amerivet Services does, minus the purple hair. While they’ve added a little drama to keep you watching, I hope you’ll watch so you’ll understand this kind of problem-solving is available right here in Southeast Michigan. Call us. Let’s talk about your problems and get you back on the road to happiness, wherever on that road you happen to be.